At the end of the week, we’re feeling generous with any and all food left from our budgeted shopping trip. So I made some fancy oatmeal based on a recipe I once tried. 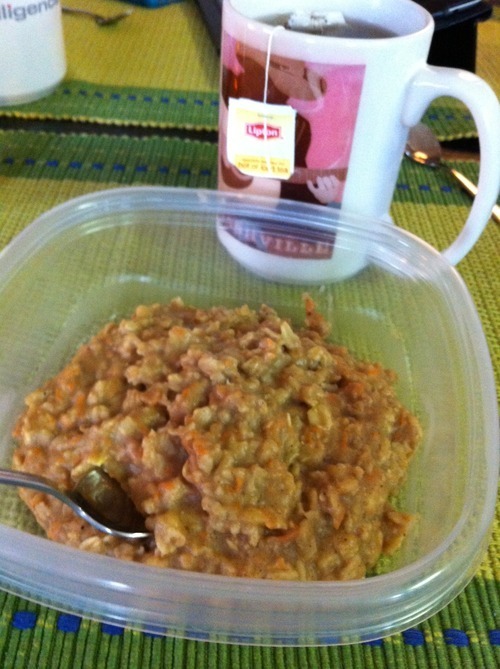 One carrot (shredded), 1 cup of oatmeal, 1 banana, 1 cup soymilk, 1 cup water, some cinnamon, nutmeg, ginger, and maple syrup cooked in a pot for about 10 minutes. We went a little too heavy on the ginger, but otherwise it was delicious. I fought the urge to add some walnuts. Or shredded coconut. Or raisins. Or dried cranberries. Sigh. This budget can both inspire and limit creativity. Moderately creative oatmeal for $1.60. And we are out of bowls from eating so much soup and oatmeal so we used gladware. Our oatmeal had one sneaky ingredient, too. 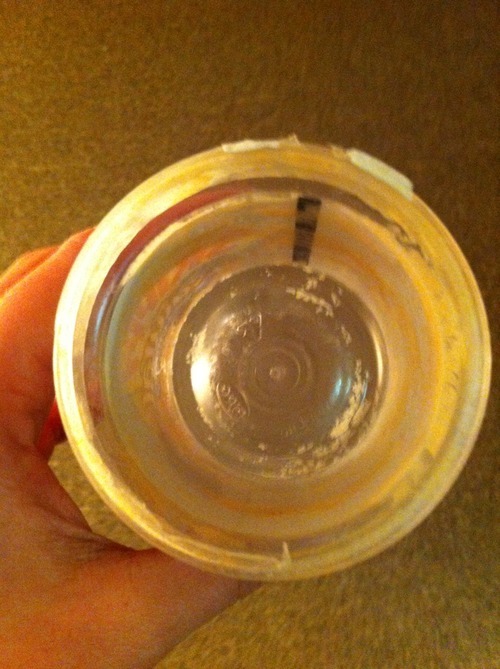 After making yesterday’s peanut butter sandwiches, the jar was pretty much completely empty. There was some left that I couldn’t reach with a knife, so I boiled some water, poured it in the peanut butter jar, shook it, and added that to the oatmeal. Here’s the jar after I was finished with it. And that is the fastest we have ever gone through a jar of peanut butter. Our final lunch is a copy of our first lunch—tuna salad sandwiches. This time I thought ahead a little more and added some carrot sticks and some celery for the husband and still kept it at $2.19. A busy day at work kept me too distracted to feel hungry, so a SNAP bar was all I needed before I left work. That plus my husband’s snacks cost us an even $1. Our final dinner was a feast! Two sweet potatoes were cut up and baked as sweet potato fries. Half of the zucchini was also sliced and baked. The final component of our dinner was the last great experiment. 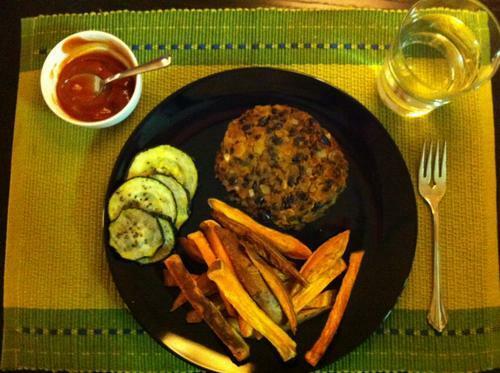 I have tried a hand full of veggie burger recipes and thought myself experienced enough to make up my own burger with what ingredients I had left: black beans, oatmeal, butternut squash, onions, and celery. I mashed some of the beans with the squash and mixed everything together along with some ketchup, mustard, soy sauce, olive oil, and spices. Typically I would try baking my burgers or grilling them on a George Foreman grill. But given the questionable nature of this made-up recipe, I decided pan frying was the best bet. Everything came together and looked like this. That burger might not be the prettiest, but it was actually not that bad! Which is good because there are two more in the freezer now. Our two, plus the rest of the plate and the other half of the can of peaches cost us $3.90. This dinner was the first this week that made me feel really full. I was satisfied after each of the other meals, but this meal—a whole sweet potato, veggie burger, and 1/4 of a zucchini—made me feel full to the point of slight discomfort. I think I used to be more familiar and comfortable with that feeling, but it now feels a little strange after a week of more modest meals. And I think I’m grateful for that. Stay tuned for what happens on the day after the SNAP challenge ends, and more about what we learned this week.